New Lexus unveiled | What Car? Lexus will display its all-new rival for the Audi A3 and BMW 1 Series at the Frankfurt motor show later this month. The new model will be based on the LF-Ch concept car and will go on sale in 2010. The LF-Ch concept car is capable of running in full EV (electric vehicle) mode, but production versions are expected to be available with conventional petrol and diesel engines, too. The only picture released shows the rear three-quarters, but clearly reveals a five-door car with a hatchback tailgate. Lexus says that more information and pictures will be revealed on September 10. 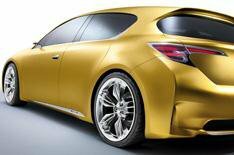 Lexus will also be taking updated versions of its IS, GS and LS models to the Frankfurt show. The revised LS luxury car has refreshed exterior and interior details, updated equipment and redesigned seating. There are also mechanical tweaks to improve the driving experience. The BMW 5 Series-rivalling GS has enhanced safety features, new exterior and interior colours and upgraded audio and navigation systems. The refreshed IS model range includes navigation and audio system upgrades and a new F Sport trim package. The revised IS F high-performance model will now be available with a limited-slip differential. Prices will be announced at the Frankfurt motor show.